Process Lasso ускорит производительность вашего ПК. Process Lasso Pro 9 был доступен бесплатно 6 декабря 2018 г. Process Lasso – это не очередной диспетчер задач. Программа имеет быстрые алгоритмы, созданные для динамического ускорения производительности вашего ПК и сохранения работоспособности в периоды большой нагрузки. Среди них всем известный алгоритм ProBalance, который постоянно уменьшает приоритет фоновых процессов, создающих проблемы, с целью улучшения скорости реагирования вашего ПК, что было доказано на практике с помощью тестов. Также в арсенале программы есть план контроля мощности Bitsum Highest Performance, который при необходимости призван обеспечивать вам максимальную производительность, а план IdleSaver сохранит ваши ресурсы, когда вы не используете компьютер. Кроме того, пользователь может автоматизировать все виды системных настроек с помощью правил и постоянных приоритетов процессов, аффинности процессора и т.д. Однако данные настройки не терпят ошибок и предназначены в основном для продвинутых пользователей. Программа может также прекрасно работать "прямо из коробки" без дополнительных настроек со стороны пользователя и выполнять свои основные функции. Посетите https://bitsum.com чтобы узнать больше. Множество небольших косметических и практических улучшений. эх... кто подскажет.. - стоящая прога или снова глаза можно сломать в этих английских дебрях. I have used various versions of process lasso. My PC is a couple years old now. Every time I have tried to use Process Lasso in the beginning everything seems fast but after a while everything seems to slow down as though the software is getting flooded with rules overwhelming it. While I get the main purpose of Process Lasso is to prevent freezes and lags, it does seem to accomplish this, but at the expense of speed. At least that is how it appears to have worked for me. In my case, I just want to speed up a few programs so they will launch faster. I have found a freeware software that does just that, you can create rules to raise the priority of processes or lower them. I use Bill2's Process Manager, it's free and works pretty good for me. I don't use it in "Learning Mode", I just add a few set of rules for a few software's I run so they will launch quicker. For me, it does seem to help. While some say "Raising the priority has no effect", all I can say is raising the priority of a few software's I run has the effect of making them launch a lot quicker, and that's what I want them to do. If you haven't tried it, try it, maybe it will help you depending on your system. Those are my opinions on Process Lasso. I have used various versions of process lasso. My PC is a couple years old now. Every time I have tried to use Process Lasso in the beginning everything seems fast but after a while everything seems to slow down as though the software is getting flooded with rules overwhelming it. While I get the main purpose of Process Lasso is to prevent freezes and lags, it does seem to accomplish this, but at the expense of speed. At least that is how it appears to have worked for me. In my case, I just want to speed up a few programs so they will launch faster. I have found a freeware software that does just that, you can create rules to raise the priority of processes or lower them. I use Bill2's Process Manager, it's free and works pretty good for me. I don't use it in "Learning Mode", I just add a few set of rules for a few software's I run so they will launch quicker. For me, it does seem to help. While some say "Raising the priority has no effect", all I can say is raising the priority of a few software's I run has the effect of making them launch a lot quicker, and that's what I want them to do. 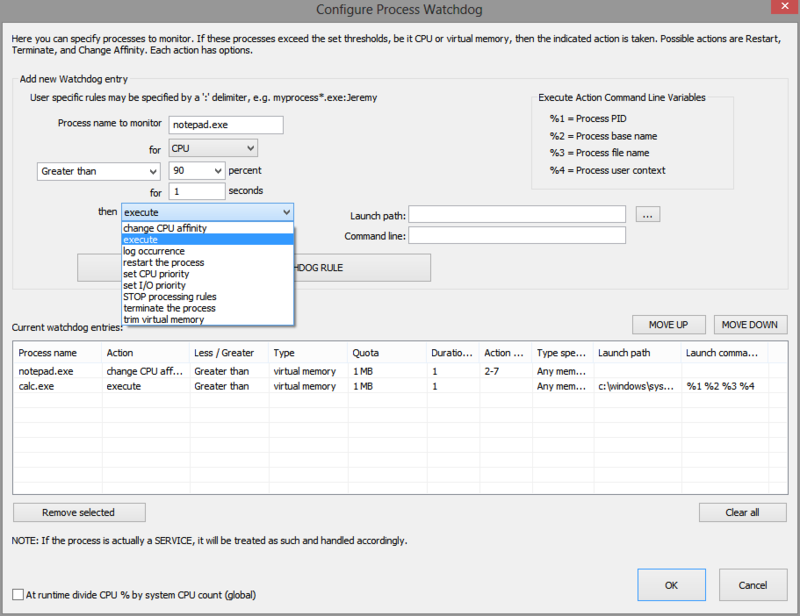 Process Lasso does give you the option to turn off the Process Governer and other things. I just don't believe there is a "One solution for all" when it comes to a software making decisions on what is actively running all the time. In the end for as much as I have tried Process Lasso, I always end up having to uninstall it because of things slowing down after a while. I am using Windows 10 and can't help but feel after a while Process Lasso starts restricting Windows 10 in some way. JMO...... If you haven't tried it, try it, maybe it will help you depending on your system. Those are my opinions on Process Lasso. I have tried various versions this in the past and found that it lacks one (to me vital) component. Being ignorant of how priorities work maybe it cant be done. Anyway this is to the developer in the hope he can incorporate it. When the program I am focusing on slows down I have tried going into task manager to see what is causing it and invariably it is my C:\ disk running at 100%. I check to see what is doing the most reading of the disk and find it is a background process. 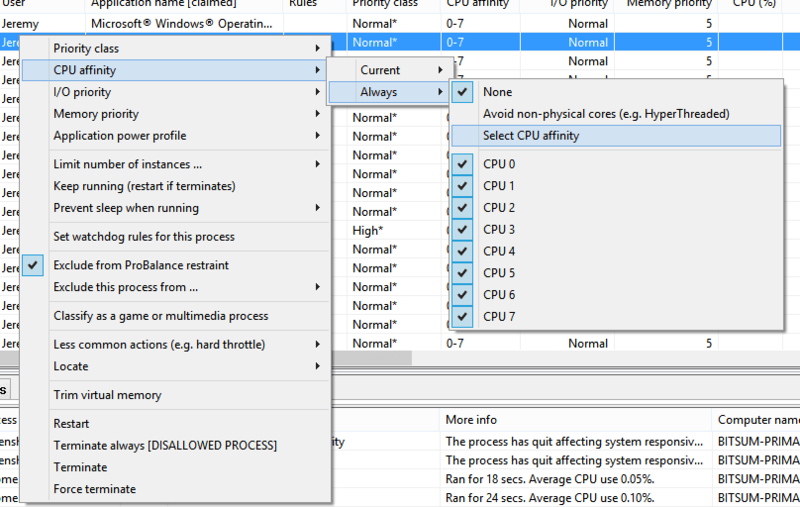 I change that process to lowest priority and the program I want to be using to highest priority but it makes not the slightest difference to the priority of disk use, maybe it changes priority of CPU use but the CPU is not slowing me down its the disk. Maybe I need more RAM. Anyway if you could incorporate a routine to solve this problem your software would be a winner but in my case your routines that automatically change CPU priorities don't seem to help. I have tried various versions this in the past and found that it lacks one (to me vital) component. Being ignorant of how priorities work maybe it cant be done. Anyway this is to the developer in the hope he can incorporate it. 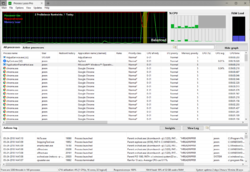 When the program I am focusing on slows down I have tried going into task manager to see what is causing it and invariably it is my C:\ disk running at 100%. I check to see what is doing the most reading of the disk and find it is a background process. 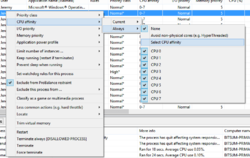 I change that process to lowest priority and the program I want to be using to highest priority but it makes not the slightest difference to the priority of disk use, maybe it changes priority of CPU use but the CPU is not slowing me down its the disk. Maybe I need more RAM. Anyway if you could incorporate a routine to solve this problem your software would be a winner but in my case your routines that automatically change CPU priorities don't seem to help. 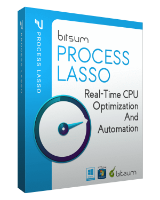 To all die hard users of Windows XP out there: Bitsum kindly offers a free pro version of Process Lasso over here: https://bitsum.com/last-windows-xp2003-compatible-build-of-process-lasso/ Take care. At this time of the latest generation of processors, Process Lasso and / or related programs have little or no benefit. That is assuming everyone has the latest hardware. Jhonny cabs, That is assuming everyone has the latest hardware. Many have not. Altho every time GOTD offers Process Lasso (thank you, Bitsum), people say it makes no difference or hinders Windows 10, I have found the software useful in one important way. When my computer fan would run endlessly, PL allowed me to isolate two Windows programs that ran and restarted constantly -- even tho I never opened them! With PL engaged, I can now prevent Microsoft Edge and Microsoft Photos from launching. I put "microsoft.photos.exe" and "microsoftedgecp.exe" on my disallowed processes list and PL terminates them every time.